"Most Onu-Matoran start out as miners, digging for lightstones. You get used to the dark pretty quickly. If you're lucky, you get the opportunity to become an archivist, but even then you are indoors and underground much of the time. These tunnels might be a little extreme, but nothing an Onu-Matoran can't handle." The Onu-Matoran are the Matoran of Earth. The Onu-Matoran have inactive Earth powers. Onu-Matoran prefer to look to history for the answers to their questions; on Metru Nui, this placed them in direct conflict with the future-oriented Ko-Matoran, leading to various incidents between the two Metru, including Onu-Matoran undermining Knowledge Towers in their expansion of the Archives, causing the Towers to collapse. On Mata Nui, the Onu-Matoran used the term "surfacers" to refer to anyone from outside their village. Onu-Matoran normally prefer to stay underground; they are uniquely adept at seeing in darkness, but averse to sunlight, which can easily blind them. They are also among the strongest types of Matoran, and tend to spend much of their time mining. The Onu-Matoran living in Mata Nui and Metru Nui value Duty and Destiny most out of the Three Virtues, from which they derive their Principle of Prosperity, and the Skill of Stamina. Identifiable physical attributes of Onu-Matoran include primarily black armor, with dark gray, purple, tan, or orange Kanohi and accents, as well as deep green eyes. Onu-Matoran are one of many male Matoran types. Aiyetoro: A Miner on Mata Nui. Akamu: A Crafter on Mata Nui. Azibo: A Prospector on Mata Nui. Bomonga (transformed): Eventually became the Toa Hagah of Earth. 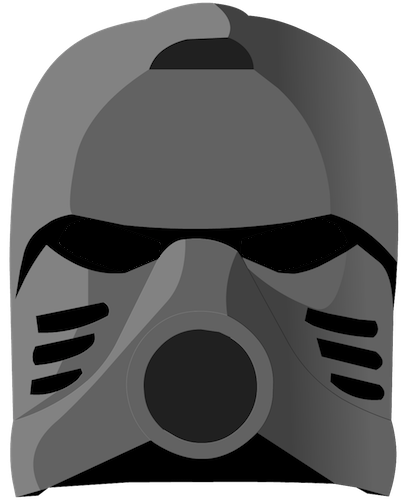 Damek: A Guard on both Mata Nui and Metru Nui. Dosne: The mining captain on Mata Nui. Gar: Former Mahri Nui resident and best friend of Defilak. Garan: The former leader of the Voya Nui Resistance Team. Gatherer (transformed): Once a leader among Matoran, but was forcibly recruited by the Dark Hunters after he impeded one of their missions. Kaj: A guard who hails from Metru Nui. Mamru: The Chief Prospector on Mata Nui. Mavrah (revived): An Archivist from Metru Nui who fled with a group of Rahi he was studying rather than letting them be driven out of the city. Midak: An Onu-Matoran who prefers the light and enjoys living above ground. Was an Ussal tender on Mata Nui. Nuparu (transformed): The Engineer who invented the Kralhi and Vahki on Metru Nui and the Boxor on Mata Nui. Later became a Toa Inika and then a Toa Mahri. Onepu: Captain of the Ussalry, five-time winner of the Great Ussal Race, and right hand to Turaga Whenua. Reysa (deceased): Hydruka herder and former Mahri Nui resident; killed by a Giant Squid which served the Barraki. Savage (transformed): Became a Toa and now a Toa Hordika Dark Hunter. Subterranean (transformed): An Onu-Matoran of Metru Nui; now a Dark Hunter who hunts Toa. Taipu: A strong but slow Onu-Koro miner, who was part of the Chronicler's Company. Tehutti: A miner on Mata Nui and an archivist on Metru Nui. Whenua (transformed): Once an archivist until he became a Toa Metru and Toa Hordika, now a Turaga of Earth. Another Chief Archivist who served in this role prior to the Great Cataclysm; he resumed this post after returning to Metru Nui.